Nifty Futures on the monthly charts one timeframing for the last 5 trading months with all time high at 9366. Intermediate trend is up as well with less rotation seen so far on the weekly timeframe. On the Daily Charts markets are moving in a layered consolidation with indicates a weak market structure and the volatility for the Indian Market stood at 11.44 as on 2nd May. Increasing volatility is the only key for better trading opportunities in the upcoming trading sessions. We are in the 19th week that since the start of the year 2017 Nifty Futures haven’t lost not even 1% on weekly closing basis. And its been 114 days i.e since 15th Nov 2016 Nifty haven’t lost 2% on EOD basis. And when comes to unfaded gaps. Nifty futures has 7 unfaded gaps since the start of Jan 2017. 2)Double Mechanical Reference at 9378. 1)Price opens within the range and gets acceptance above 9345(Rally High) – This could bring higher activity in price towards all time high. 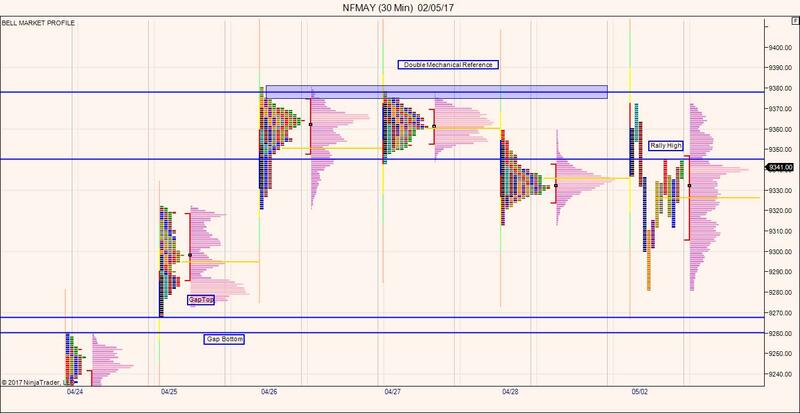 2)Price opens within the range and gets acceptance below 9345(Rally High) – This could bring one more range bound trading day with value overlapping to lower. 3)Gap up above 4 day high and fail – This could target nifty towards the recent unfaded gap 9260.